When you need onsite business computer repair and support services, PC Fixer is the team for you. We can usually arrive at your business within four hours if you call before 10 a.m., and troubleshoot any brand of broken system. Whether you have a Dell, HP, Toshiba, or Mac computer, we provide excellent business IT support. 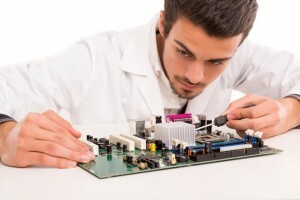 Our team specializes in all types of repairs, from replacement of desktop computer power supplies, motherboard replacement, and operating system re-installations, to updating software, upgrading video cards and RAM, Exchange server troubleshooting and optimization, and everything in between and beyond. With our onsite support services, you can save yourself the expense of buying an entirely new machine and get same day repairs and solutions. We provide quick services for all your maintenance needs. Our specialists can address your problems right there in your office or home. We simply diagnose the problem, and provide you with the service you need. When you have an urgent problem, we are ready to come to you. Call us and request our emergency response service and we will drop everything to be at your location as quickly as possible (for more information please see our rates page). Wherever you are in the Los Angeles region, our workers will arrive at your site prepared to do the work while you wait. Our knowledgeable technicians will focus on fixing any problem you have. And any other needed maintenance! There are times when you simply cannot spare the time and hassle of sending your equipment into a shop for repairs or routine service. When you require same-day computer repair, contact us. We bring you years of expertise that you can rely on. Throughout Los Angeles County, we will be at your door when you need us. 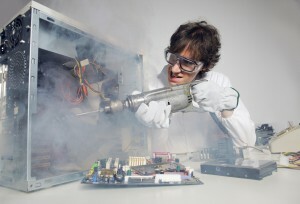 Call PC Fixer today at 310.948.0588 and a friendly and attentive expert will bring you the best in onsite computer repair. Please also feel free to email us at info@pcsfixer.com and we will respond to your inquiry promptly.